Just in time for the holidays, here’s Zuma’s Top 10 Gift Ideas for all those folks who have no idea what to buy that special someone this Christmas. Of course, there’s a strong leaning towards office supplies, office technology and office furniture, but you’ll be shocked at the creativity and uniqueness of these gifts ideas. That’s right – check out the stapler made famous by Milton and loved by thousands! The perfect gift for the person who has everything. Milton loves it, and so will that person on your gift list! 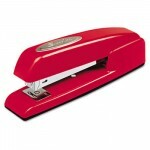 The Swingline Red Stapler. Perfect for students of all ages, and for professionals as well. Get quality stereo sound from your laptop or home computer with this specially priced system. Subwoofer provides the extra BASS! We know, laminators sound boring, but once you get your own, you’ll be laminating everything that isn’t nailed down. Perfect for recipes, news clippings, kid’s school work, scrap booking, signs and more. Give the gift of security and protect your loved ones from identity theft. This 8 sheet paper shredder even shreds credit cards, staples and paper clips. Cross cut shredding gives extra security, and at under $40 this is a great value. Stylish stainless steel Italian designing combined with the famous DeLonghi Accuflavor system gives you a coffee maker with all the bells and whistles including 24 hour programmability. Great coffee maker that looks awesome on the counter. 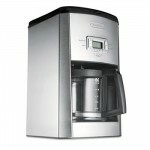 This Delonghi makes incredible coffee, and has sleek Italian stainless steel styling. This printer does it all, and for only $81.33! It prints, scans, copies and faxes with incredible color resolution for the money – 4800 x 1200 dpi. Fast at too 28 ppm for. Great for home office and students! Exceptionally comfortable high definition optical mouse is great for desk computers or laptops. It’s the Logitech ergonomically designed rubber grip that sets this apart. Comfort and quality for under $26! I love this case! It’s a great laptop carry case / brief case and a rolling overnight suitcase all in one. Protective computer sleeve for your laptop and handy straps to hold clothing, this bag does it all for quick trips! Can’t believe I’m ranking a label maker this high, but once you have one for your home or office, you’ll be amazed at how many uses it has. This DYMO model has all the features you need and it’s under $30 so it won’t break your budget. An awesome gift that will be used. 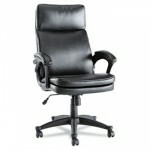 They will remember you every time they set down in this luxurious leather chair. It retails for $549, so you’re getting the soft leather quality and tilt swivel features of a $500+ chair for only $164.95. For the holidays, the chair ships free too! It’s classic quality and design at a low price only you will know about. They’ll think you spent hundreds more. Our Number 1 Gift Idea - The Alera Toliz Chair. Quality and classic styling at $380 Discount! The holidays are a wonderful time for friends, family and for getting a little time off to relax. However, the stress of finding the right gift for all those on your list can get you down. Hopefully this list gives you at least a couple of unique gift ideas at great values to make your shopping experience a little easier this year. Happy holiday and enjoy the season!!! This entry was posted in Office Supplies Shopping Tips and tagged Holiday Shopping Tips, Office Furniture, office supplies, Office Supplies Online, Top Gift Ideas, Unique Christmas Gifts. Bookmark the permalink. But a smiling visitor here to share the love. BTW, great writing style. We’re glad you enjoyed the blog Shenna. Thanks for sharing!